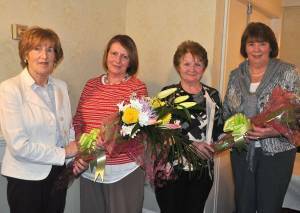 Teresa Moyles Making a presentation of a bouquet of flowers to Ann Heffernan, and Teresa McNulty making a presentation of a bouquet of flowers to Carmel Prior, for their services to the Lotto committee over the years. Tom McNulty President of Crossmolina Deel-Rovers making a presentation to Carmel Prior in appreciation of her commitments to the club over the years. Crossmolina Festival Sub-Committee are looking for Stewards (male and female) to help out with the St. Patrick’s Weekend Festival, in particular with the ‘Electric Light Parade’ taking place Friday evening, 17th of March. There will be a meeting on Tuesday night, 14th of March 2017 at 7:30p.m. in the Enterprise Centre in Crossmolina for anyone interested in being Steward. There was no winner of the Crossmolina Deel-Rovers GAA Club Lotto Jackpot on Saturday night 25th February. 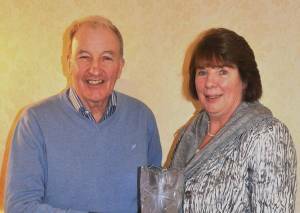 The numbers were 9 – 13 – 23 – 26 Bernie Gardiner Church St Crossmolina matched three numbers and won €150. The draw took place in Christy’s Bar.This week’s jackpot is €8,100. Many thanks for all your support. U10 James O’Boyle Chapel Rd, U11 Matthew Gordstskyy Chapel View, National Schools Niall Coggins Deer Park U12 Darragh Syron Chapel Rd U13 James Williams U14 Dr Loftus Gold Medal Sean Hegarty Boughadoon, U15 Robert Murphy The Boreen, U16 Eoin McDonnell Ballyvicmaha, U18 Tommy Walsh Bunnavilla Keenagh. The Table quiz winners were 1st Thady Connor Sean McGuinness Patrick Mulligan 2nd Colm Hegarty Eoin O’Boyle Lily Hegarty Sarah Gough Bridie Gough Lucy Lavin 3rd prize Keelan Hegarty Aoife Mulligan Diarmuid Coggins Matthew Gordstskyy. Spot Prize winners Daniel Lynch, Tom Gough, Ethan Reilly, Niall Maughan, Luke Williams, Conor Caden, Diarmuid Walsh, Eanna O’Boyle, Keelan Hegarty, Peadar Fergus. The death occurred peacefully on Sunday 26th February at Abbey Breaffy Nursing Home Castlebar of Henry Ormsby in his 90th Year formerly of Fotish Crossmolina. His remains reposed at Hiney’s Funeral Home on Tuesday evening with removal to St Mary’s church Crossmolina. Funeral Service on Wednesday with burial afterwards in the adjoining Cemetery. Henry was pre-deceased by his sister Elizabeth brother Oliver, is survived by his nephew Cecil Fotish relations, extended family, friends and neighbours. May he rest in peace. Crossmolina Team Kieran Haran Stephen O’Malley Stephen Duffy Hugh Cafferty Darragh McCormack Jonathan O’Boyle Thomas Cafferty 0 – 2 Cathal Carolan 0 – 1Martin McAndrew 0 – 1 Mark Leonard 1 – 1 Mickie Loftus 0 – 1 Conor Rowland Dean Loftus Brian Benson 1 – 8 Tommy Walsh Subs Thomas McNulty for Conor Rowland Ciaran McDonald 0 – 1 for Dean Loftus Joe Keane for Tommy Walsh David Howley for Hugh Cafferty. 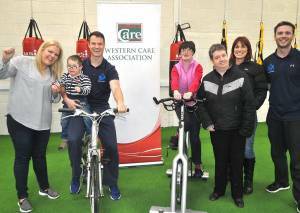 North West Fitness Academy will be raising funds for Down Syndrome Mayo and Cluainin Day Service Western Care on March 12th 10am in 45k cycle Crossmolina-Lahardane-Pontoon-Knockmore-Ballina-Crossmolina. If you like to take a sponsor card and raise the funds then you will cycle for free. If you need any more information feel free to get in touch. Pictured at the Launch of North West Fitness Academy fund raising 45k Cycle on Sunday 12th March in aid of Down Syndrome Mayo and Cluainin Day Service Western Care are from left to right ; Nichola Gilmartin, Down Syndrome Mayo, Ryan Gilmartin son, Ciaran Sweeney North West Fitness Academy, Noreen Naughton Western Care, Chris O’Donnell Western Care, Siobhain Loftus Cluainin Day Service Western Care, Brian Fitzpatrick North West Fitness Academy. We are really pleased to be in a position to set up a Day Care Centre for the older population of the area. There will be a meeting on 7th March 2017 at 8pm in the Enterprise Centre (above the library), Crossmolina. Kilmurray Parent and Toddler Group meet in Kilmurray Community Centre every Tuesday morning from 11am to 1pm. All are welcome €4 per family. The death occurred peacefully on Wednesday 22nd February at Mayo University Hospital Castlebar of Dorothy (Dor) Lynn nee Corcoran Main St Crossmolina. Her remains reposed at Hiney’s Funeral Home on Thursday evening with removal to St Tiernans Church with burial on Friday in Crossmolina Cemetery after requiem mass. Dorothy was pre-deceased by her husband Mick is survived by her sons Sean UK, Michael Ballina St, Seamie Castlebar, Tony USA, Padraic Lake Rd Crossmolina, Daughters Siobhan Chapman UK, Doreen Rowland Ballina, daughters – in – law, sons – in – law, grandchildren, nieces, nephews, brother – in – law Frank Lynn, sisters – in – law May and Kathleen Lynn, relations, friends and neighbours. May she rest in peace. After a great start in this Michael Walsh League in Hollymount on Sunday week with a goal from Kevin Mulhern, the Home side Hollymount /Carramore came back after a slow start with four points from Darren Coen. Those were replied with a like similar amount from Cathal Carolan, Dean Loftus, Mickie Loftus and Brian Benson tacked on further points to leave Crossmolina leading at the break by three point’s 1 – 7 to 0 – 7. The plans for the Festival of Lights is progressing well with registrations for the parade closed and close to one hundred entries confirmed, which means extra stewards will be required. If you are willing to lend a Helping Hand please call or text Damian on 086 2648495. The parade will also be covered by a Sky TV Channel courtesy of Micheal Leonard & Coolturk Quarries with the programme been broadcast early April. After three complete sell-out performances in Crossmolina Town Hall with indeed a number of people not being able to gain entry Crossmolina Drama Group are pleased to announce that they are now gearing up for one final performance of Jimmy Keary’s hilarious comedy “Mother Knows Best” which will take place on Thursday 2nd March at 8pm. This performance will be staged as a tribute to the late James Hogan who was a member of the group and who died suddenly on the 31st of December last. Proceeds from this performance will go towards the purchase of a Defibrillator for Crossmolina Town, fitting tribute to a man who was at the heart of every community endeavour. If you were disappointed to miss our last performances or want to support this worthy cause we look forward to seeing you there – Crossmolina Town Hall, Thursday 2nd March at 8pm. 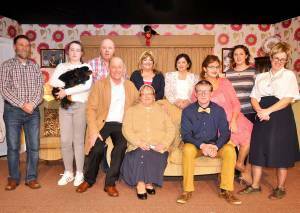 PHOTO : Crossmolina Drama Group Back row from left to right Robert McKinley, Lainey Jordan Flynn with Tess’s Dog (Nappy) Francis Gilroy, Louise Maughan, Marian Howley, Caroline Sharkey, Grace McKinley, Ann Fox. Seated from left to right Anthony Walshe, Eileen Leonard, Billy Connor. 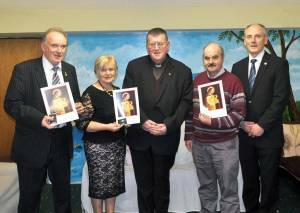 Pictured receiving their service pins at the Annual Mid-Killala Pioneer Dance in Hiney’s Upper Deck are P.J.Hughes (50 Years Gold Pin) Breda Mulkearns (50 years Gold Pin) Fr Pat Munnelly (Mid-Killala Pioneers Spiritual Director) Gerard Cawley (25 years Silver Pin) Muredach Tuffy (Chairperson of the National Board of Management. Members of Mid Killala Pioneers Committee pictured in Crossmolina Social services centre at their annual meeting Back from left to right Meave Tierney Secretary, Elizbeth Syron Kilmurray Delegate, Martina Gardiner Chairperson Mid Killala, Mary Butler Treasurer, Liam Hendry Ballina Vic Chairman and Pro, Paddy Kneafsey Knockmore/Rathduff Delegate. 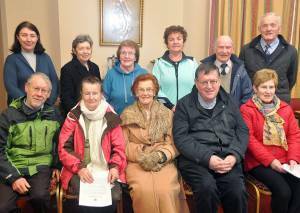 Front Row from left to right David Connelly Knockmore/Rathduff Delegate, Una Birrane Crossmolina Assistant Secretary, Ita Halloran Ballina Delegate, Fr Pat Munnelly (Spiritual Director) Maureen Egan Ballina Delegate. We are really pleased to be in a position to set up a Day Care Centre for the older population of the area. There will be a meeting on 7th March 2017 @ 8pm in the Enterprise Centre (above the library), Crossmolina. If you have ideas, time, social or admin skills and are in any age bracket please come along. There will be a follow up meeting on 14th March to formalise a group to take this exciting and essential project forward.